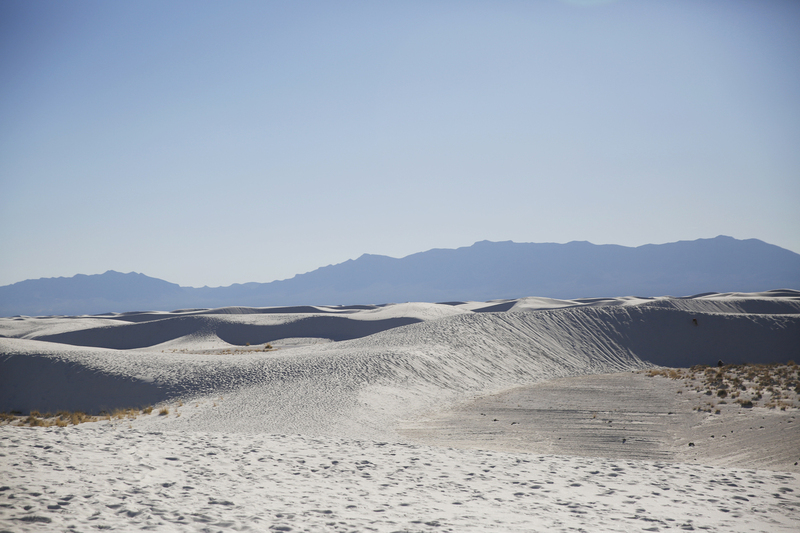 PHOTOS: The Creamy, Sculpted Dunes Of White Sands National Monument There's no place like it on the planet: White Sands National Monument in New Mexico. It's the world's largest gypsum dunefield: miles and miles of stunning white landscape. Landscape of White Sands National Monument in southern New Mexico. 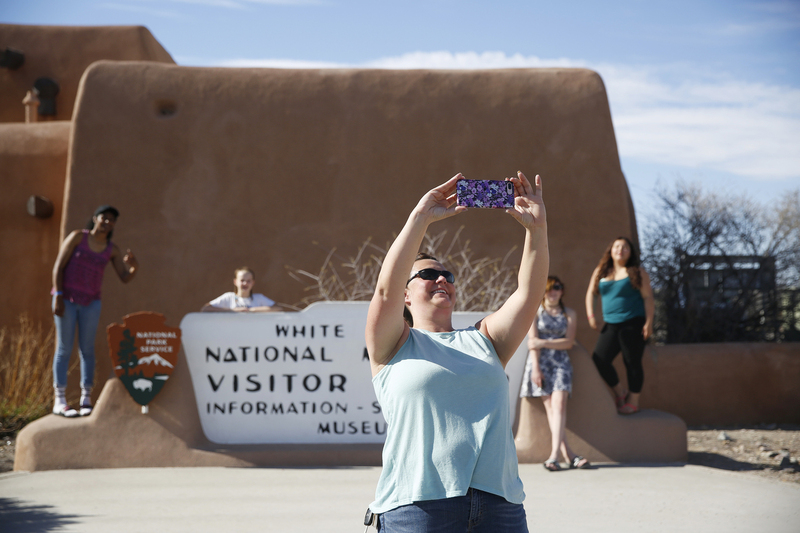 Tourists take photos outside the entrance of White Sands National Monument in New Mexico. 1. "Beautiful" — Shannon Miller's description — is an understatement. The landscape is spectacular and otherworldly. "It's like you're in another planet," as park ranger Eugene Ibarra tells us. "The only thing that reminds you that you're still in planet Earth is that the sky is blue." Andrew Schwallie and Logan Poppell out for a 5 mile run through the dunes. They're stationed nearby at Holloman Air Force Base. 2. Most of the New Mexico dunefield actually lies outside the boundaries of the park. White Sands National Monument is dwarfed by the White Sands Missile Range, a military testing area for the U.S. Army, and most of the dunefield lies within that missile range. The world's first atomic bomb was detonated at the Trinity test site in the missile range, just 65 miles north of this park, on July 16, 1945. Several weeks later, the U.S. dropped atomic bombs on Hiroshima and Nagasaki. Left: Cassi sets up her umbrella on top of a dune. Right: Footprints in the sand. 3. 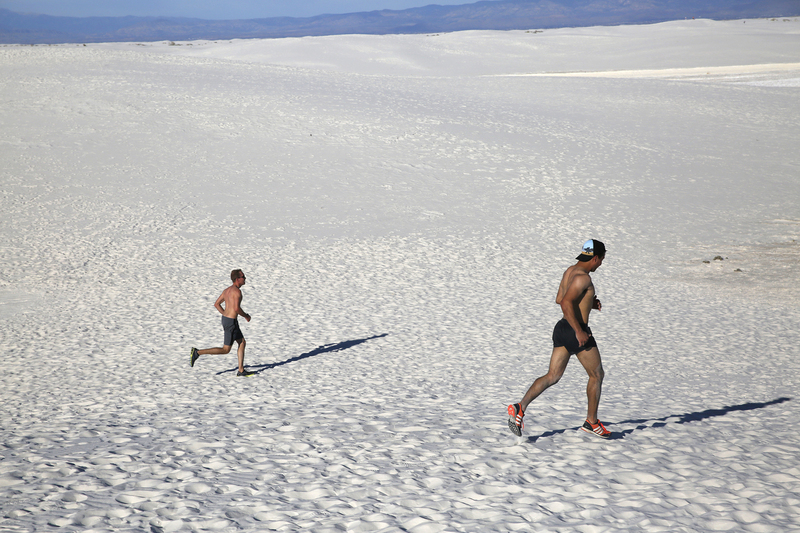 They're not exactly the "only" white gypsum sand dunes in the world, but pretty close. The New Mexico dunes cover a vast area: 275 square miles. 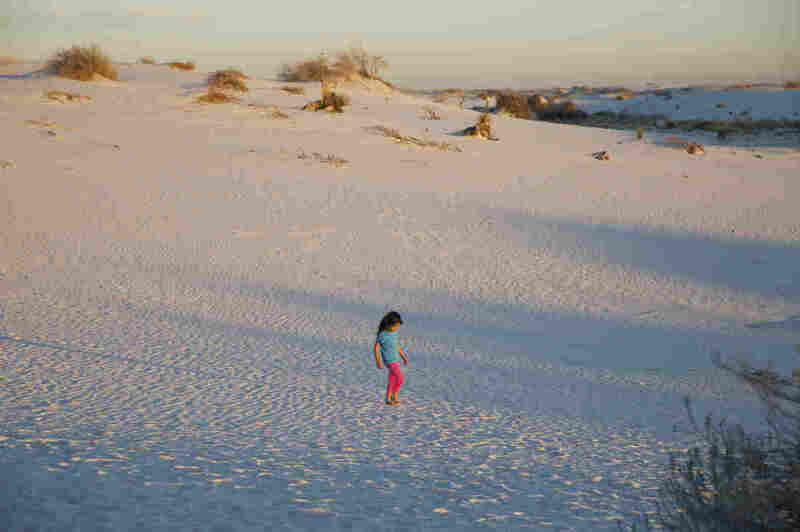 The next biggest gypsum dunefield is in Guadalupe Mountains National Park in Texas. Total dunefield area: about 3 square miles. Families play on the dunes. 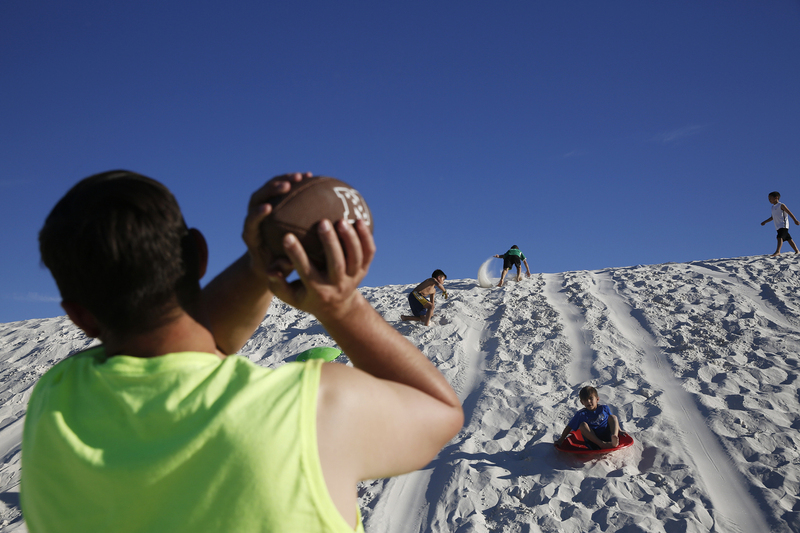 At White Sands, dune sledding is encouraged — they even sell plastic flying saucers in the gift shop. 4. The dunes are made of the soft mineral gypsum, laid down 250 million years ago when the southwestern U.S. was covered by the Permian Sea. Later, that seabed was pushed up into the mountains that ring the basin that surrounds the area. Rainfall dissolves those deposits, carrying the gypsum down and replenishing these sand dunes, which shift constantly with the winds. A girl plays in the sand during the evening sunset stroll. 5. Even when the sun is broiling hot, the sand stays cool under your bare feet. That's because the sand is made of gypsum crystals. Left: Brittany Peterson goes barefoot. Right: Park Ranger Eugene Ibarra runs the soft gypsum sand through his hands. 6. There are signs warning that there's no water available beyond the visitor center, but it's easy to forget just how unforgiving this park can be — because it's so beautiful. And people have died here. Just two summers ago, a mother and a father didn't bring enough water on their hike, and died along the Alkali Flat trail. Their 9-year-old son survived. Park Ranger Ibarra poses for a portrait. 7. Because White Sands National Monument is right next to White Sands Missile Range, the park occasionally shuts down during missile testing. The park service also warns visitors to avoid anything that looks like unexploded ordnance. Another neighbor is Holloman Air Force Base. Three years ago, an unmanned drone aircraft from Holloman crashed inside the park, spilling jet fuel and scattering debris. Cleanup and environmental remediation has been slow; that part of the park is still off limits to visitors. 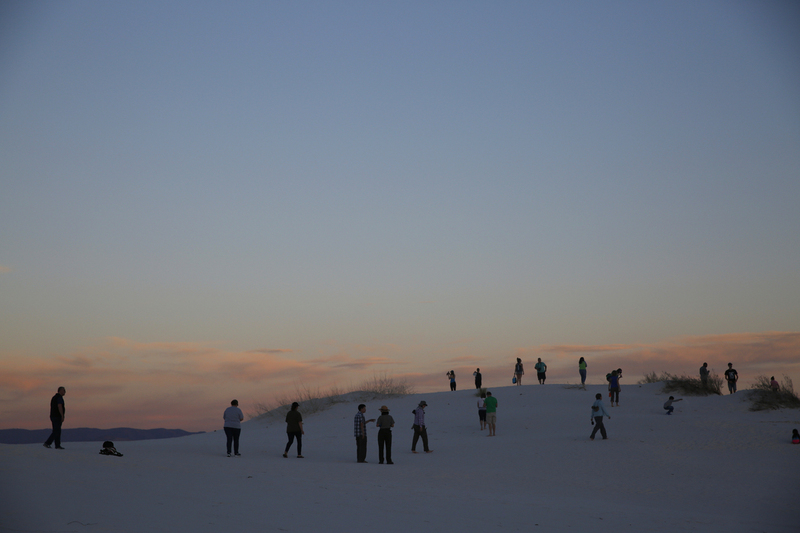 Park visitors watch as the sun sets over White Sands. 8. 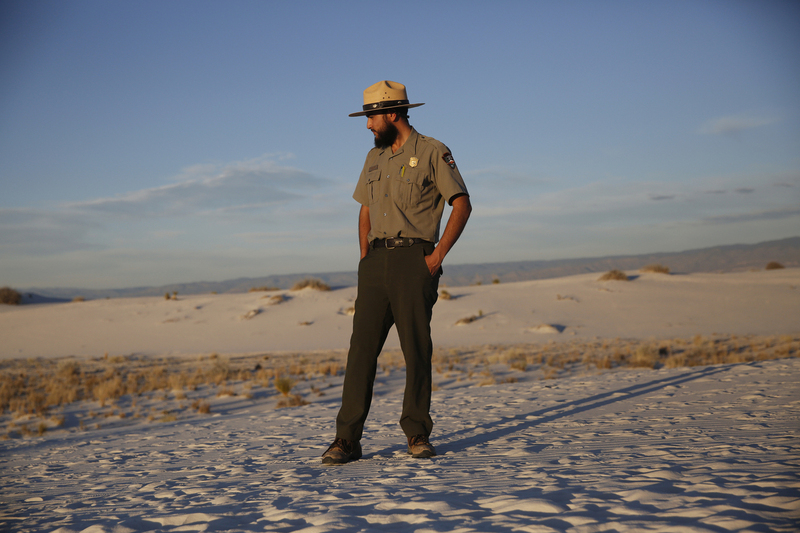 Park rangers lead daily sunset strolls through the dunes. Once the sun goes down, the sand gets pretty chilly underfoot. With a permit, you can also go horseback riding through the dunes. It's purely BYOH. The "Our Land" series is produced by Elissa Nadworny, with production help on this story from Anjuli Sastry. This post has been updated to make clearer that the white sand stays cool because it is made of gypsum crystals.